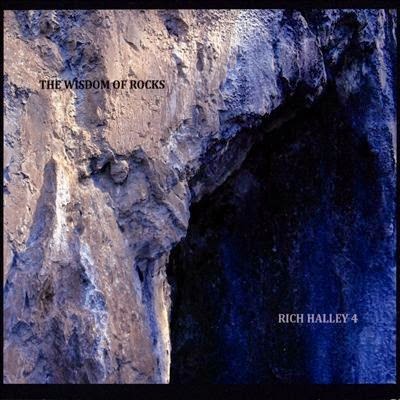 bebop spoken here: CD Review: Rich Halley 4 - The Wisdom of Rocks. Rich Halley (tenor); Michael Vlatkovich (trombone); Clyde Reed (bass); Carson Halley (drums). Bill Meyer wrote in Down Beat that Rich Halley's music occupies the point where populism and freedom come together. An astute observation that I can't fault. Certainly there is freedom-a-plenty, harmonics on harmonics from the tenor, bravura trombone passages that encompass everything from Kid Ory to Roswell Rudd and beyond without reaching the point where it jars on well-tempered ears. Based in Portland Oregon, leader Halley has 16 albums to his credit. He also wrote, or had a hand, in all twelve original compositions on The Wisdom of Rocks, the title of which refers to the imprint of events over the long years of rocks' existence - longer than mankind!. There are bebop based themes as well as more reflective moments all of which combine to make this a disc for all seasons. Only the most died in the wood traditionalists or the fire (in a petshop) brigade could fail to find this amalgam of genre to their taste. Pianoless quartets aren't new - I still have a soft spot for the Gerry Mulligan Quartet - but this one moves in a different direction. I guess if Gerry's quartet (the one with Brookmeyer) had been born 50 years later they may well have been working the same side of the street as the Rich Halley 4. Rich Halley 4 - The Wisdom of Rocks is available on Pine Eagle Records or www.richhalley.com.